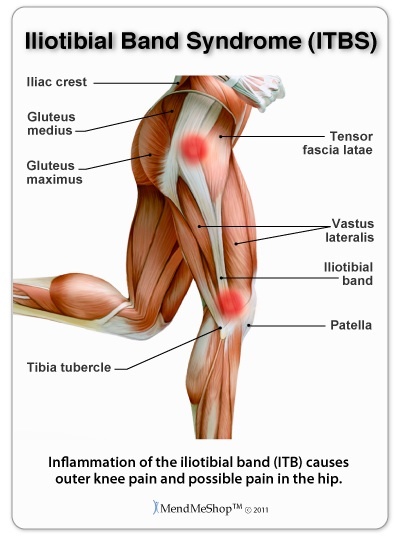 Iliotibial band syndrome (ITBS or ITBFS, for iliotibial band friction syndrome) is a common injury to the knee, generally associated with running, cycling, hiking or weight-lifting (especially squats). The symptoms range from a stinging sensation just above the knee joint, to swelling or thickening of the tissue in the area where the iliotibial band moves over the femur. The stinging sensation just above the knee joint is felt on the outside of the knee or along the entire length of the iliotibial band. Pain may not occur immediately during activity, but may intensify over time. Pain is most commonly felt when the foot strikes the ground, and pain might persist after activity. Pain may also be present above and below the knee, where the ITB attaches to the tibia. It will also hurt if you twist your knee to turn a corner. Iliotibial band syndrome is one of the leading causes of lateral knee pain in runners. The iliotibial band, or IT band, is a thick band of fascia on the lateral aspect of the knee, extending from the outside of the pelvis, over the hip and knee, and inserting just below the knee. The band is crucial to stabilizing the knee during running, as it moves from behind the femur to the front of the femur during activity. The continual rubbing of the band over the lateral femoral epicondyle, combined with the repeated flexion and extension of the knee during running may cause the area to become inflamed. Causes can be from training, muscular or anantomical. Uneven left-right stretching of the IT band, which may be cause by habits such as sitting cross-legged. How Can I Treat/Prevent It? If the pain persists go to our MEDICAL PARTNERS PAGE to find a specialist to assist you in finding a solution to your problem.